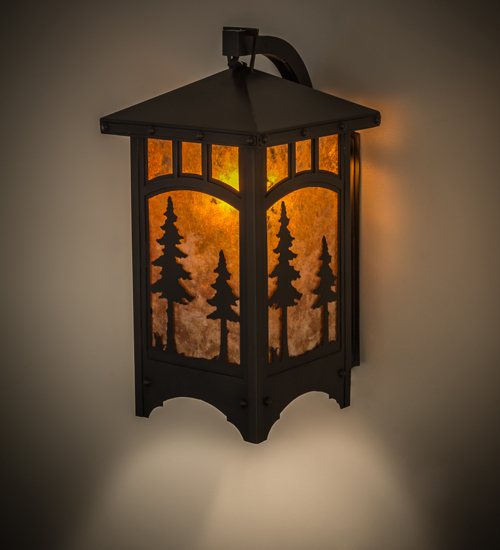 Description: A charming nature inspired set of Tall Pine trees is depicted while a New moon shines brightly over the forest, on this wall sconce design. Beautiful ambient light is diffused through Amber Mica, which is complemented with Solid Brass accents and hardware featured in a Craftsman Brown finish. The fixture, which is ideal for any room in a home, hotel, restaurant or other commercial setting, is handcrafted in the Meyda manufacturing facility at the foothills of the breathtaking Adirondack Mountains in the USA. Custom styles, designs and sizes are offered. Energy efficient lamping options are available. The fixture is UL and cUL listed for Wet Locations-- Outdoor and Indoor Applications.